They are ALIVE!!! steemCreated with Sketch. It is that time of year to start seeds. Of course you never put in just one seed per cup, what if it doesn't germinate? Looks like this year I am having good success! The cups on the left are cauliflower and the ones in the far right are cabbage. Both of these came from Baker Creek, I highly recommend them! 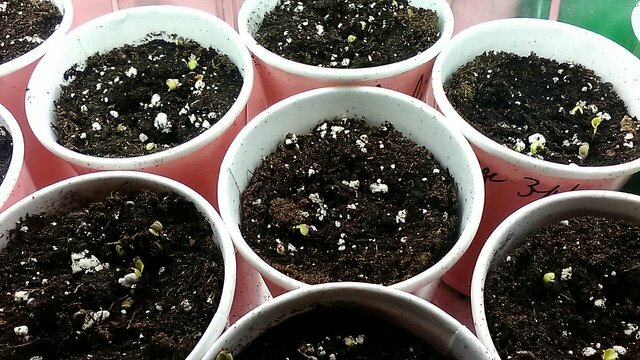 I have these growing under my new grow light setup, this is the first year using grow lights. I took this picture a couple of days ago and even in that short amount of time these little guys are getting big. I will try to post an update soon! Thank you so much for being an awesome Partiko user! You have received a 47.31% upvote from us for your 10619 Partiko Points! Together, let's change the world! Spring fever is here! Are these plants you have grown before? I think I’m going to give cabbage a try this year myself. It's a yes and no. I have tried both of these but last years results didn't work well for me, I also were not using seeds from Baker Creek. Due to the fact I don't have much space to grow in my yard I went with the following cabbage because the heads are closer together so in theory I should be able to grow more of them. I see you have not done a post of your own in a while, are you going to start posting again here this spring? 2 inches you say? What part of the world are you in? Did you start the tomatoes indoors first? eastern europe. yeh the plants are about 2 to 3 inches. i tall started them around February 15th.they'll go out in may they are inside still. Nice!! For me I will be starting peppers and tomatoes in probably the first week of April. kewl. i hope it all goes well. do you ever preserve them tomatoes with salt in jars? i do it works well. you boil the jars in a big pan. I have not grown enough to save, but this year I am going to try to do just that. Growing a bigger variety, so will see! Howdy sir simms50! At first I didn't see them but they are indeed starting, I heard alot about Bakers.